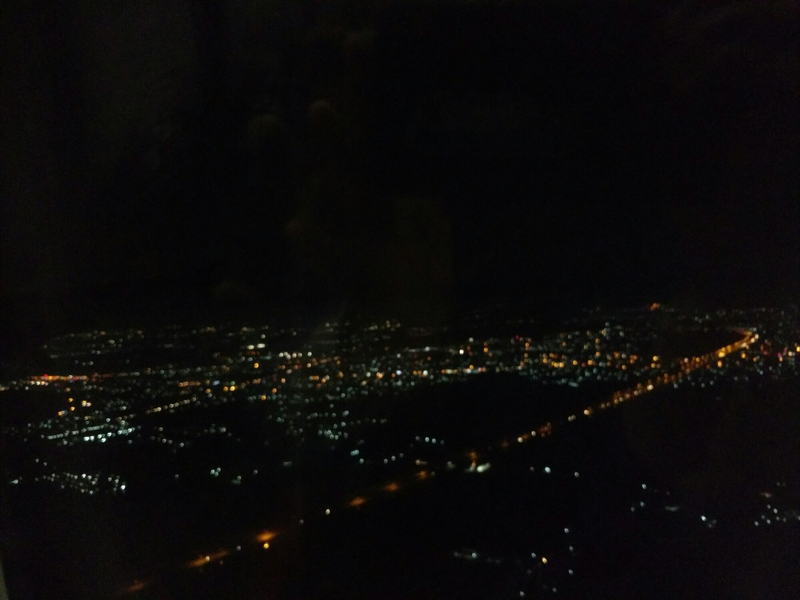 The last time I traveled in a flight(it was in December 2015, while I was traveling from Hyderabad to Chennai with my colleagues), I could see a whole area on earth from above from the window. I found those pics in my mobile, and wanted to share it with you guys.. simply. Actually, I had not gotten a window seat, but the man who did was kind enough to ask if I needed it. I told him I’d sit if he wasn’t really interested. And lo, I was by the window! I was very excited that day. 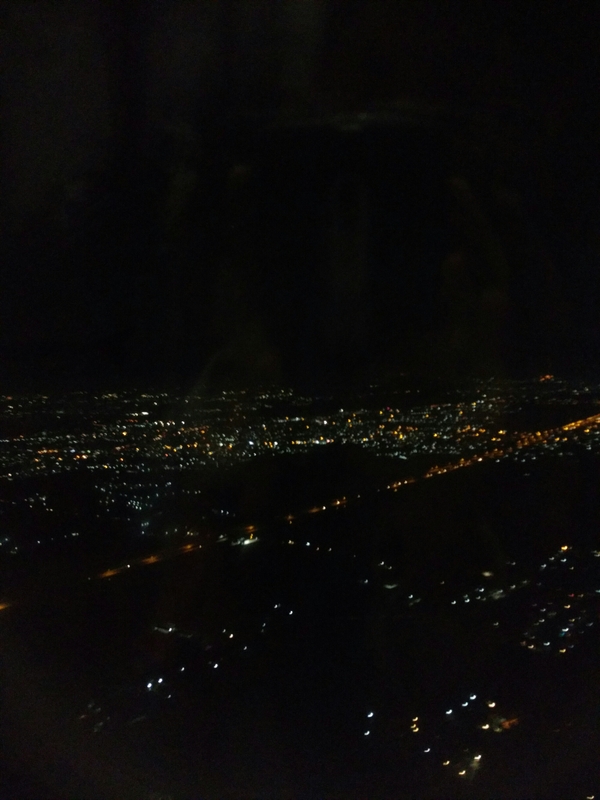 It was wonderful, looking at all those tiny lights from above. It was like looking from the viewpoint of the gods above; looking at the little things on earth and thinking : how did this flight get this high? How clever must those tiny humans be, to have invented this flying machine? Awed by everything, I started taking photos. The guy who offered me the seat probably thought I was crazy and probably thought of never offering his seat to others again. But I didn’t care. I wanted a few pictures of what I was seeing right then. I wanted people to see what I was seeing. I wanted to share this feeling with everyone. But then I didn’t.. I did keep it as my WhatsApp profile picture for a good few days, but that was because I did not know what picture to keep. Now that I saw this pic in my mobile again, I thought I’ll share it with the folks who read my blog (although I’m sure there won’t be many). 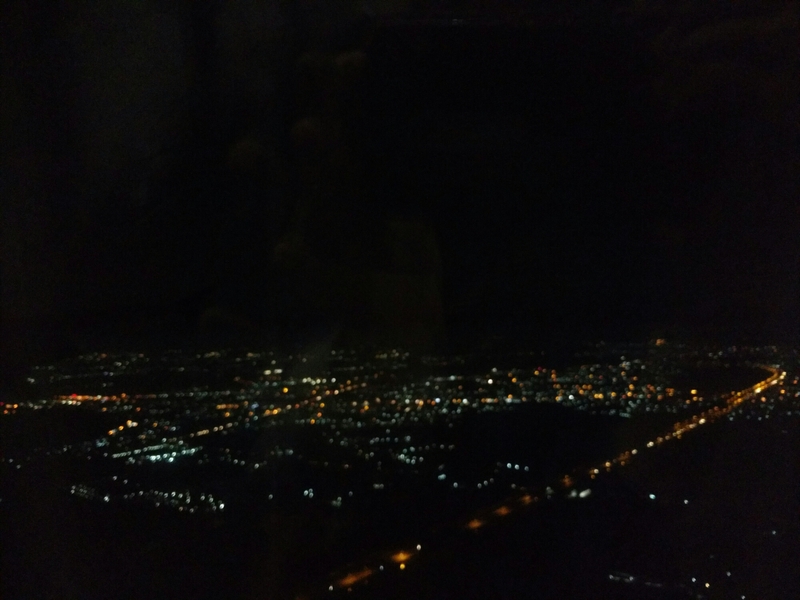 Now this is one less thing I’ve to do in life: travel in a night flight by the window and look at the earth below. Cluttered with glassy flakes of snow. Crushing wood to a silvery haze. Was the little icicle-nosed fay. And around swirled the mist. Made up the naughty midnight hue. As glossy ice stilettos glided forward. She whipped the snow out of sight. Boisterously, she was off into the night. Right now, I’m travelling… on a bus… homeward bound… from college. Mom will be anticipating me to reach correctly for dinner, and I’m going to be on time for dinner, as always. And right now, getting an ideal chatting partner would be lovely, though I have already got a very nice person beside me to chat. In fact, even now, she’s chatting with me. And now, since I have a little charge in my laptop, and since there was nothing better to do, I thought I’d open my laptop and login to my blog. And what do we have here? The Daily Post asks me: What person whom you don’t know very well in real life — it could be a blogger whose writing you enjoy, a friend you just recently made, etc. — would you like to have over for a long chat in which they tell you their life story? And now, this woman’s stop is going to come, and she’s going to get down. And I will be all alone… or maybe not, because there’s another woman beside her, who also talked to me, and might consider chatting more. You see, it takes almost two freaking hours to reach home from college, and most of the time, I’m all alone. Most of the time, I do not get chatter-women as my seat-mates and most of the time, there’s no charge left in my laptop. But yesterday and today were certainly not ‘most of the time’; I was lucky enough to get lovely chatting women as my seat-mates. But who would I call my ‘ideal’ seat-mate, you ask, do you not, Daily Post dearest? That person is non-existent. Let’s call him/her X. Let’s make it ‘him’, because I find guys fascinating. Let’s call him ‘X’. X likes to wander wherever his legs take him, Now and again, he goes trekking on the mount Dottabetta, and he’s once visited the Himalayas, too! And he has a warm smile that’s inviting just like the woman beside me(because I need at least that much to approach a person for a chat), and he thinks he has room for one more to accompany him in his adventures. And the most important thing: he likes to teach all these to someone. And to this question, my ideal chatter seat-mate would say ‘yes!’ And that is all I need! Alright! I’m almost home. I need to get off the bus in a few minutes, and it’s 8 pm already. I’d better stop thinking of non-existent thrilling stuff and get back to the reality that awaits.